The spring sports season was one for the books. 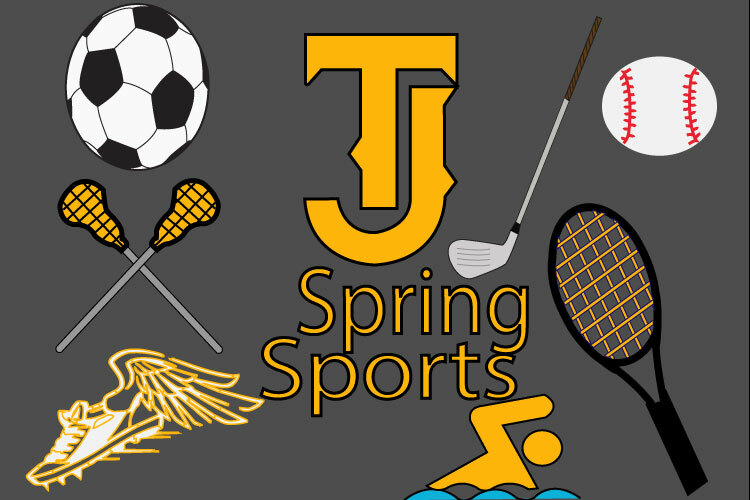 TJ spring sports exhibited a lot of talent this spring and as the seasons come to a close, athletes are proud of their accomplishments. Athletes in Track, swimming, soccer, baseball, lacrosse, and golf all played their hearts out this season, and their hard work and dedication were certainly evident. Track and Field, coached by Darius Reed, will compete at state on May 19th. The seniors had great showings throughout the season with an astonishing 4th place result at the George Washington Patriot Invitational. Although TJ’s renowned DPS event Twilight Meet was cancelled due to inclement weather, the team competed in several other important invitationals including the Mullen Invitational, George Washington Patriot Invitational, Liberty Bell, and the Denver North Viking Invitational. Led by coach Justine Sullivan, the boys’ swim team had a grand year of development and continued to stir some water, with sophomore Michael Crum qualifying for state in the 200 Freestyle with an impressive time. Junior Jackson Moore expressed that, “Overall, we had an awesome season, with some dedicated swimmers that improved.” The team has incredible potential with many young swimmers, and they will continue to prosper in the coming years. The Spartan girls’ soccer team, coached by social studies teachers Matt McHenry and Garien Behling, ended the regular season with an impressive record of 12-3. Ending the season ranked 3rd in the league, TJ beat South for the 3rd place title. The Lady Spartans were unlucky this season and unfortunately did not have the state ranking to make playoffs; however, they had a strong season overall. With only three seniors graduating, TJ’s soccer program will continue to grow in the coming years and hopefully deliver a state championship in the coming seasons. Boys’ Baseball had a strong season as well and, although they were not state contenders, they finished the season with a 15-5 record. One of their biggest games this season occured when the Spartans beat East High School 13-12 in an overtime game. Coach Graham Baughn reflected on the season, commenting, “I’m very proud of the fight from this year’s team.” Baughn has high hopes for the future of the team and is excited to see how the younger players from this year progress. Boys’ Lacrosse represented TJ well this spring. The final record resulted in seven wins and six losses with junior Savion Johnson scored an impressive 24 goals this season. Coach Jason Klimczak continued his second year here at TJ. After only just three years of development, the lacrosse team continues to grow and improve. Although they are not playoff contenders this year, the team reflects on their season as a good one. The Girls’ Golf season was truly one to remember. Beloved coach and social studies teacher, Mark Smith, is ending his career as a teacher, but not as a golf coach. The girls continued to compete with exceptional ability, due to Smith’s hard work as a coach and the girls’ dedication to the sport. At the regional tournament, sophomores Lucy LoJacono, Reyna Baldwin, Louie Aldridge, and Catie Aldridge had incredible showings. The girls are glad that Smith is staying and will continue to make TJ golf a success. All in all, TJ wrapped up another great spring season. All of the sports have a lot of young talent ready to rise to the occasion to be the best. The future of TJ spring sports is safe with these talented athletes, but all of the seniors graduating will be dearly missed. Congratulations to each team for another strong season.